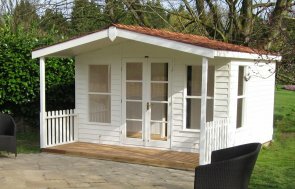 Summerhouse With Veranda | Delivery & Installation Incl. Designed in a chalet style, with the addition of a charming covered veranda to enjoy drinks or take a break from the garden, before disappearing inside as the weather cools to watch the sun go down. 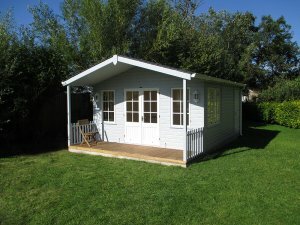 This summerhouse can be tailored to your needs, whether you want an alfresco dining area for the summer, or you need a hobby room to use all year-round. 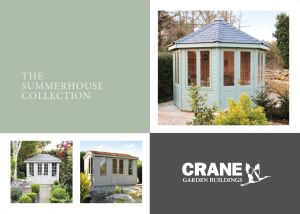 To create your own ideal Morston, please click on the Create My Summerhouse tab below. From 2.4 x 3.0m (8 x 10ft) to 6.0 x 6.0m (20 x 20ft) and plenty of sizes in between. These fully glazed doors come as standard with the Morston and allow plenty of natural light inside, as well as enhancing the chalet feel. 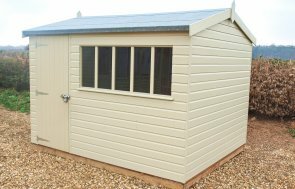 If you are adding a partition to your summerhouse, with external access, a shed door will provide access to this section. As well as multiple door options, you also have different window options to consider, to give your Morston the look you're after. These windows, as with the fully glazed doors, come as standard with the Morston to complete the chalet look of the summerhouse. If you want more light or you have another view you would like to see from your summerhouse, you can choose to add extra windows to your Morston design. 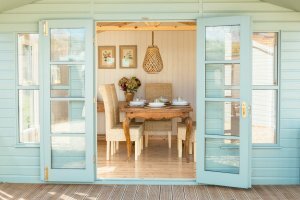 If you want your summerhouse to be comfortable for use through most or all of the year, double glazing is one of the features you can choose to help with this. The windows are all made from 4mm toughened safety glass, and are finished with polished brass or chrome furniture. You can also choose to have double glazing. You can choose from plain or Georgian-style windows. Our Morston Summerhouses come with your choice of roof covering: our heavy duty, torched-on felt is the standard material, but you can also choose either Cedar Shingle Tiles, or Slate Effect Tiles in terracotta or grey for more of a stylish effect. This is our standard roofing material: it is an extreme wear, heavy duty felt that is a non-rip material, and is applied with a propane torch to increase its longevity. This roofing product carries a 50 year limited warranty. Opt for a more traditional grey, or choose terracotta for a different look. The terracotta goes well with the lighter shades in our paint ranges. 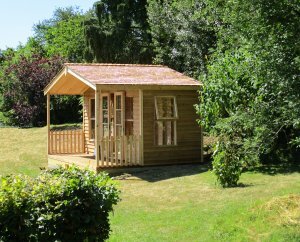 Our Blakeney, Morston and Holkham Summerhouses come treated with light oak wood preservative as standard, which protects the timber from fungi and woodworm and gives the timber a natural looking sheen. We also offer two paint ranges to choose from: these are Valtti and Farrow & Ball to give the best possible paint options for your building. The Morston Summerhouse comes unlined as standard for purely summer use, but you can also choose to have lining and insulation in the walls and ceiling. This makes it a perfect all-season retreat and greatly enhances the finished look of the building, increasing comfort and decreasing noise levels. There are then 2 options for lining your Summerhouse: natural matchboarding, or painted matchboarding. To have it painted, you can choose our own Ivory internal paint colour, or choose between 5 Farrow & Ball paint colours. This is the standard option, to give you a building to use just in the summer months. 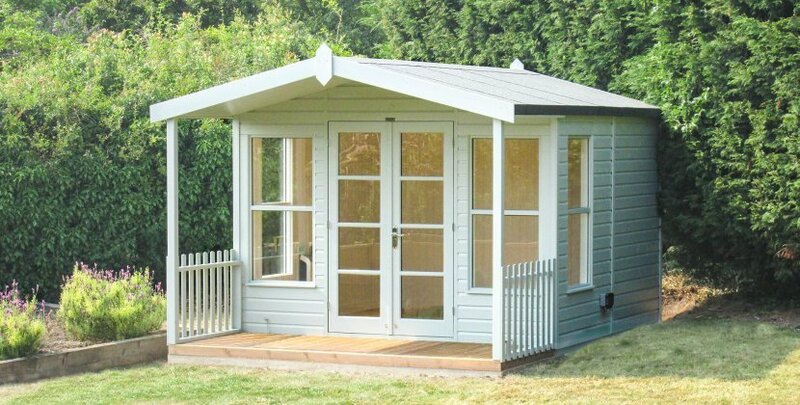 To add extra versatility to your Summerhouse, we also offer the option of adding partitions. You can have an external partition, which is generally used to add a storage section, or you can have an internal partition or partitions, to allow you to add extra rooms, such as a toilet, or internal storage space that can be accessed inside, without having to go outside. Side Walls - ex 19 x 125mm shiplap or weatherboard cladding on ex 38 x 75mm planed framing, all using high quality Scandinavian redwood. Doors - 1 pair of joinery-made double doors 1830mm high x 1200mm wide, 4 pane, fully glazed with 4mm toughened safety glass, fitted with a mortice lock and polished brass or chrome fittings. Windows - 2 or 4 sets of fixed windows fitted with 4mm toughened safety glass in the front gable and 1 set of top-opening windows on each side. With joinery made frames and finished in polished brass or chrome furniture. Floor - ex 19 x 125mm tongue and groove floorboards on ex 38 x 75mm tanalized planed floor joists set at no less than 450mm centres. Roof - ex 19 x 125mm tongue and groove matchboarding, on ex 38mm x 75mm planed framing covered with green mineralised 35kg roofing felt. Trusses are used on all buildings 3.6m long and above. Roof overhangs the building by 1.2m to match the veranda. Veranda - 1.2m deep sheltered veranda with decking. Height - 2.0m to eaves. Electric Pack - The electric pack is an extra option, but if you choose it, it will consist of 4 double 13 amp switched MK sockets, a gang light switch, a waterproof double external 13 amp MK socket, an 8 way consumer unit: the main switch takes 2 slots - 63 amp MCB - 16 amp and 6 amp blanks, spotlight sets are fixed into the ceiling of all our Blakeney Summerhouses, and there is also the option of having a thermostatic 2kva wall heater. Paint - Externally, your Blakeney will come in our Light Oak preservative, which protects the timber from fungi and woodworm, or you can choose between two paint systems: Valtti or Farrow & Ball. Both paint systems offer an opaque coverage and have long re-decoration cycles with a wide range of natural colours to choose from. For more information, please see the Paint Ranges section on the Options tab. Looking for a chalet-style summerhouse? Looking for a different roof style? Looking for a corner summerhouse?